The present invention is concerned with soft-magnetic iron effect pigments with metallic luster, which are produced by grinding reductively treated carbonyl iron powder, and which are passivated either during grinding or subsequent to the grinding. The products find application in the decorative and functional fields in paint and lacquer coatings, coloring of plastics, in printing, cosmetics, and glass and ceramics. Carbonyl iron powder is produced by decomposition of vapor-state iron pentacarbonyl Fe(CO) 5 in cavity decomposers (see leaflet by BASF AG, Ludwigshafen, RCA 3210, 0686-2.0, FIG. 1) and is available commercially (BASF AG, Ludwigshafen, as well as ISP, Wayne, N.J.). However, these powders initially have a relatively high grain hardness and contain up to 1.5% carbon, approximately 1% oxygen and up to 1% nitrogen. Their iron content is around 97%. If these powders are subjected to a treatment at an increased temperature in a hydrogen flow or in a hydrogen-containing atmosphere, the so-called “reduced carbonyl iron powder” is obtained, which is characterized by an iron content of over 99.5% and a high ductility, and which is particularly suitable as a starting product for grinding for the production of iron effect pigments. Reduced carbonyl iron powder is also available commercially (BASF AG, ISP). The powders are currently used in the field of powder metallurgy, for medical purposes, and in the production of electronic components. The lower microhardness of carbonyl iron permits a relatively greater deformation of the granules as compared to the aluminum. This effect is of importance among other things for the covering power of metallic coatings. Aluminum pigments have a high specific covering power, not least due to their low density (2.7 g/cm 3). Metals with higher densities, such as brass, iron (7.87 g/cm3), etc., are comparatively at a disadvantage. However, this disadvantage can be compensated for by a greater shape factor during the grinding of carbonyl iron powder. Organically modified phosphonic acids of the general formula R—P(O)(OR 1)(OR2) wherein R=alkyl (branched or unbranched), aryl, alkyl-aryl, aryl-alkyl, and R1, R2═H, CnH2n+1, with n=1-6. R1 may be identical to or different from R2. Organically modified phosphoric acid and esters of the general formula R—O—P(OR 1)(OR2) with R=alkyl (branched or unbranched), aryl, alkyl-aryl, aryl-alkyl and R1, R2═H, CnH2n+1, with n=1-6. The passivation by means of anticorrosive protection barriers with chemical and physical protection mechanisms can be implemented in many ways. The barrier effect of the anticorrosive coating may be improved, for example, through the action of phosphoric acid, phosphorous acid, molybdate-containing, phosphor-containing and silicon-containing heteropolyacids, chromic acid, boric acid and other known anticorrosive agents as they are described, for example, in Farbe und Lack (1982), pages 183-188. Oxide layers, such as SiO 2, ZrO2, Cr2O3 or Al2O3 or mixtures of the same may also be formed. Preferred are SiO2 layers with layer thicknesses of 20 to 150 nm that are prepared according to sol-gel methods. The obtained effect pigment displays a high degree of metallic luster and the magnetic permeability of soft iron powder. The following parameters were determined from laser beam refraction measurements (Cilas measurements) for the size distribution: d 90:27 μm, d50:18 μm (average particle size) and d10:10 μm, and the specific surface was determined based on BET measurements as 4 m2/g. In the appended FIG. 1, scanning electron microscope images of the pigments are shown, which reveal a relatively round edge shape of the pigments. The parameters of the size distribution, as well as the shape are typical for “silver dollar pigments”. In the appended FIG. 3, the doctor blade impression is characterized colorimetrically and compared to a comparable aluminum pigment (Stapa MEX 2156, d 90:25 μm, d50:16 μm and d10:9 μm; silver dollar pigment). The brightness L* has been applied against the viewing angle relative to the reflection angle (angle of incidence of 45°). What becomes apparent is the very much darker behavior of the iron pigment across all viewing angles. 100 g reduced carbonyl iron powder as in Example 1 are entered into a ball mill of dimensions 30 cm×25 cm, which is half-filled with 1.5 mm diameter steel balls. Added to this are 0.56 g white spirit and 6 g octanophosphonic acid ((HO) 2OP—(C8H17)). The obtained product with metallic luster and high magnetic permeability is magnetically separated from the grinding medium, filtered and subsequently stirred for over one hour in 1 liter 0.1% aqueous H 3PO4 solution. The flake shaped iron pigment is subsequently filtered and dried in the drying chamber at 95° C. The product is not susceptible to rust for a period of 60 days. 90 g iron pigments, as produced in Example 2, are dispersed in 300 ml isopropanol in a 1-liter laboratory reactor and brought to the boil. One adds 20 g tetraethoxysilane and 5 minutes later 11.6 g distilled water. Afterwards 9.6 g 25% aqueous NH4OH solution are passed in over the course of 2 hours and the mixture is allowed to boil for another 4 hours. The reaction mixture is then cooled down, stirred overnight, filtered off by suction the next morning and dried in the vacuum drying chamber at 90° C. The product has a SiO2 content of 5.8%, which corresponds to a SiO2 conversion yield of 96%. In standard run tests, the product shows an excellent run resistance and is thus suitable for aqueous lacquer systems. 1. 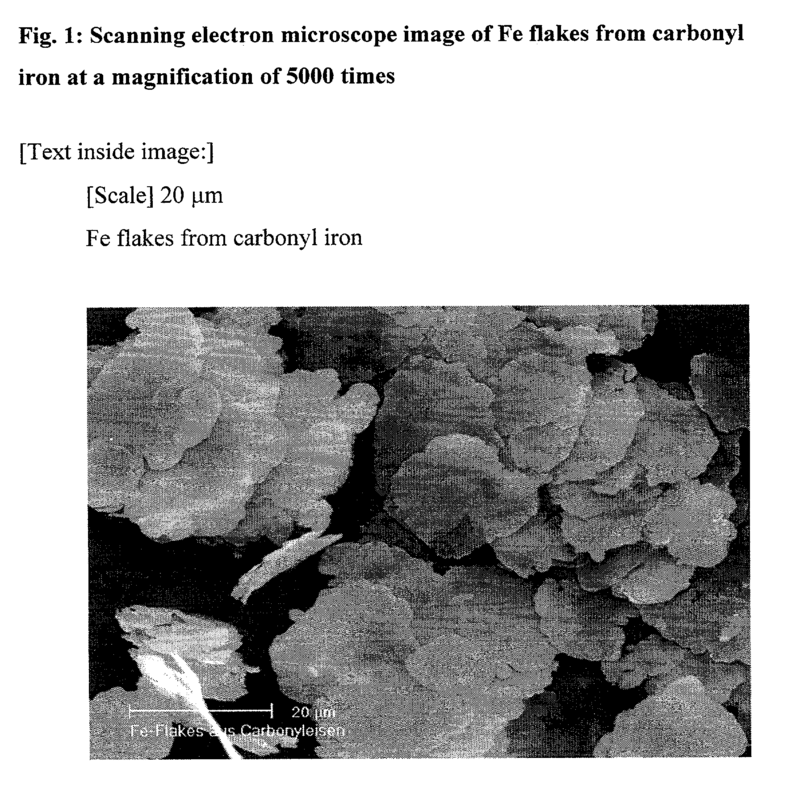 A flake shaped iron pigment, wherein the pigment is produced from reductively treated carbonyl iron powder. 2. A flake shaped iron pigment according to claim 1, produced from reductively treated carbonyl iron powder of at least 99.0% purity. 3. 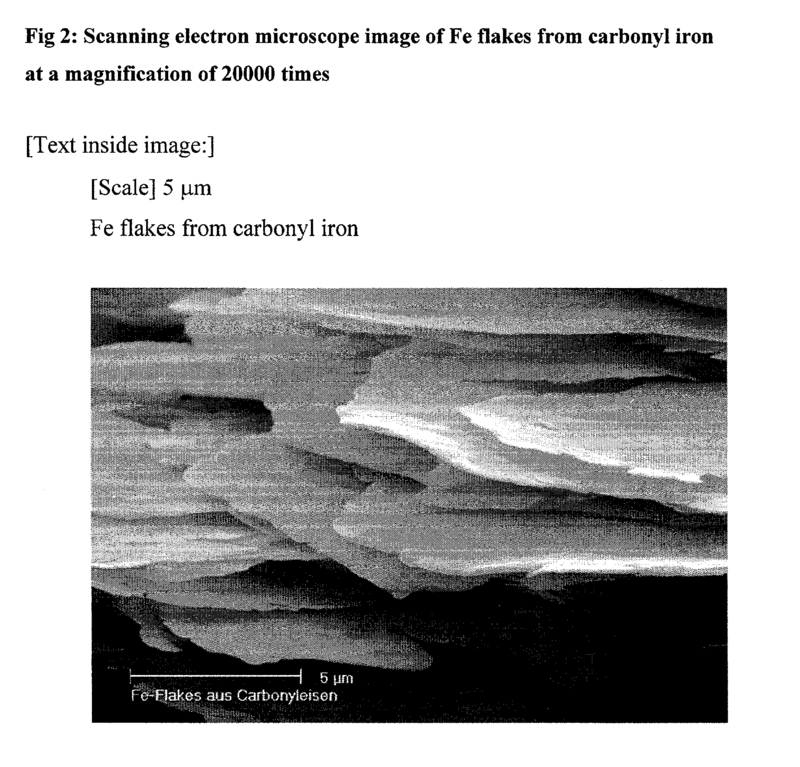 A flake shaped iron pigment according to claim 1, wherein it has a particle size of the carbonyl iron powder of 0.5 to 100 μm, especially 1 to 60 μm. 4. A flake shaped iron pigment according to claim 1, wherein it has an average particle size of the iron flakes of 5 to 100 μm, especially 6 to 60 μm, and average thicknesses of 500 to 30 nm, especially of 200 to 40 nm. 5. A flake shaped iron pigment according to claim 1, wherein the iron pigment is coated with a passivating inhibitor and/or anticorrosive protection coating. 6. A flake shaped iron pigment according to claim 5, wherein the passivating anticorrosive protection layer is composed of silicon oxide, zirconium oxide, aluminum oxide/hydroxide, phosphate, phosphite, chromium oxide, borate or mixtures of the same. 7. A flake shaped iron pigment according to claim 5, wherein the inhibitor coating is composed of fatty acids, carboxylic acid derivatives, organic phosphates and phosphonates and their esters, organically functionalized silanes, aliphatic or cyclic amines, aliphatic and aromatic nitro compounds, oxygen-containing, sulfur-containing or nitrogen-containing heterocycles, sulfur/nitrogen compounds of higher ketones, aldehydes and alcohols, thiols, b-diketones, b-ketoesters or mixtures of the same. 8. A flake shaped iron pigment according to claim 1, wherein a passivating anticorrosive coating according to claim 6 is applied initially, followed by an inhibitor coating according to claim 7, or an inhibitor coating according to claim 7 is applied first and then a passivating anticorrosive coating according to claim 6. 9. A method for the production of pigments according of to claim 1, wherein the dry or wet grinding of reductively treated carbonyl iron powder in the presence of auxiliary grinding agents. 10. A method for the production of pigments according to claim1, wherein dry or wet grinding of reductively treated carbonyl iron powders in the presence of auxiliary grinding agents and/or inhibitors and/or anticorrosive compounds. 11. A method for the production of pigments according to claim1, wherein the wet or dry grinding of reductively treated carbonyl iron powder and subsequent application of an anticorrosive barrier. 12. Use of flake shaped iron pigment according claim 1 as effect pigment in the painting and lacquer industry for coloring plastics, in printing, cosmetics and as reflector material in the production of multi-layer effect pigments. 13. Use of flake shaped iron pigment according claim 1 as magnetic effect pigment in the painting and lacquer industry, for coloring plastics, in printing, cosmetics, and as reflector material in the production of multi-layer effect pigments. 14. 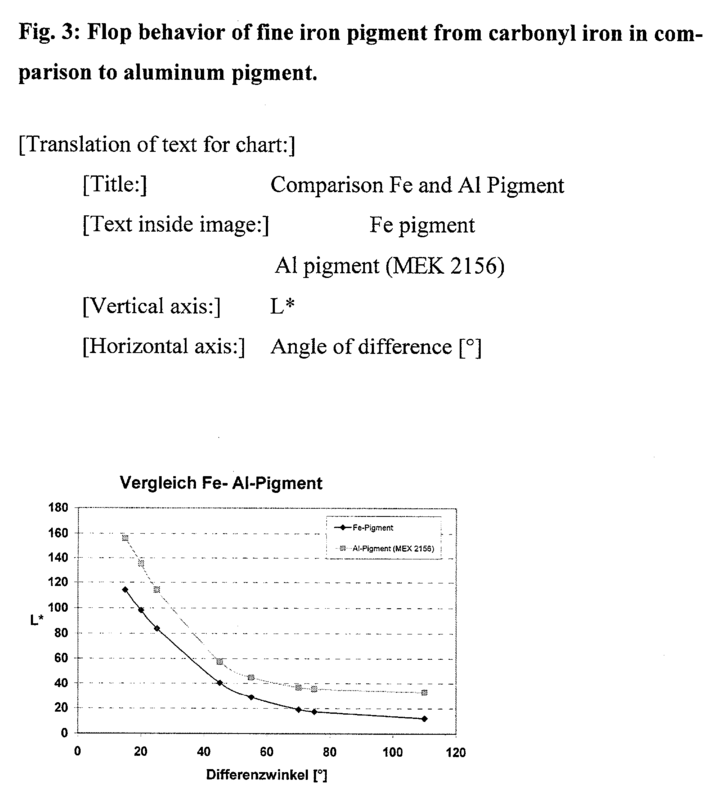 Use of flake shaped iron pigment according claim 1 as magnetizable effect pigment in security printing. ES2244684T3 (en) 2005-12-16 Soft iron pigments.